Afghan cuisine is generally rich in calories and perfectly suits the dry and cold weather of this rugged terrain. Kabuli Pulao is the national dish of Afghanistan and is very popular in South Asia and the middle east. 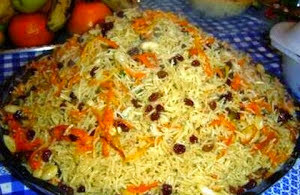 Although there are many variants of pulao, Afghan version is known to be richer and fulfilling. Combination of rice, lamb meat, carrots, and raisins make it a perfect meal for every occasion. If you're planning to make it, do make sure you prepare it in bulk as your friends and family members are going to ask for it again and again. The authentic Kabuli pulao recipe is not spicy at all but if you prefer a bit hot version, do not hesitate to add some hot red and green chilies in your preferred form. Delicious Kabuli pulao with raisins and carrots made in an easy way to surprise your loved ones by making this popular and yummy pulao recipe of Afghanistan. Sauté carrots and raisins in butter and keep aside. Heat 2 tbsp oil and stir-fry onions until translucent. Add rice and mutton broth and cook until tender. In a separate pan, heat some oil and fry all whole spices and add lamb pieces. Add salt to taste and cook for 5-6 minutes. In a greased baking dish, arrange lamb piece in the center and cover with half-done rice. Sprinkle carrots and raisins on top. Preheat oven to 250 °C and bake for 20 minutes. Garnish with ginger julienne and serve hot in a large flat dish.